Years ago, when I shopped for a bottle of wine, I’d enter the liquor store and head straight to the Argentinian or Italian section. These exotic, wine-focused countries just seemed like the appropriate nations to source from. Flash forward to present-day, and I no longer gravitate towards the foreign wine aisles. BC Wines have come so far, and it’s their corner of the wine shop that I beeline to. Besides the desire to support our local growers and passionate, hard-working wine-makers, a vast majority of BC wines really do just taste great. On more occasions than I can remember, I’ve sat in Okanagan winery tasting rooms unable to find a wine I didn’t want to purchase. Sandhill is one of those wineries. Located in Downtown Kelowna (at the Calona Vineyards Winery Boutique), you can sample dozens of vintages, including award-winning single vineyard wines and many of the rare and hard-to-find Small Lots varietals, which are made with grapes from small, specific areas within a vineyard, which Winemaker Howard Soon feels have big potential. No matter the season, my pick is usually something big and bold. That’s why I love Sandhill’s Small Lots Sangiovese (2012). It’s deep, dark and smoky with undertones of cherry, spice and leather. 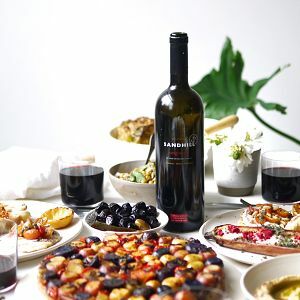 I’m no wine expert, but this wine seems to go with everything…or at least it paired beautifully with the Mediterranean-Middle Eastern fusion dinner party feast I prepared. 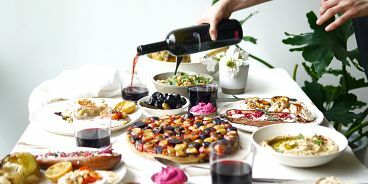 Scroll down for dinner party details. The single vineyard philosophy is the foundation of Sandhill’s delicious wines. What this means is each bottle of Sandhill wine is made from grapes that were grown in one of six unique BC vineyards. Because each vineyard has a unique blend of soil, slope, sun exposure and drainage, grapes from each location will bear unique characteristics, giving Howard Soon lots to play with. His wines are truly distinct. Read more about Sandhill Wines here. Sandhill Small Lots Sangiovese (my top pick) and Sandhill White Label Gamay Noir were luscious pairings for this exotic, flavourful meal. My rule: every bite must be accompanied by a sip of wine. This heightens every bite in such a major way!!! You can buy Sandhill Wines through their site here or at BC VQA wine stores. Find this recipe (called Surprise Tatin) on page 22 of Ottolenghi’s cookbook Plenty (my favourite of his collection). This is the third time I’ve made it, and it’s always a winner. Tips: if using a springform pan, place it on a baking sheet when cooking so the liquid doesn’t seem through the cracks of your pan and burn in your oven. Substitutions: I used vegan butter and vegan goat cheese instead of their dairy counterparts. 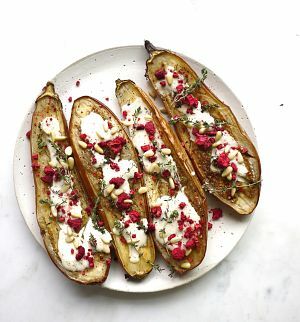 Find this stunner of a dish (called Eggplant with Buttermilk Sauce) on page 110 of Plenty. Substitutions: pomegranates aren’t in season so I used dehydrated raspberries (any small sweet fruit will work). Also, instead of buttermilk I used almond milk with a splash of apple cider vinegar and instead of Greek yogurt I used vegan plain yogurt). I usually wing this one but here’s a recipe that I’ve used in the past that works well. For the rub, I usually combine about ½ c. of olive oil, salt, spice of choice, pepper, and loads of minced garlic. I love having hummus on the dinner table to lather on everything most things. 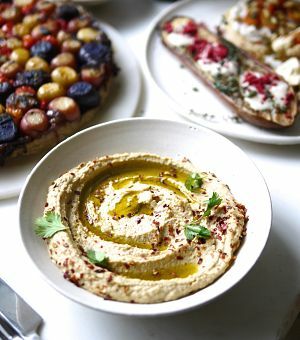 If you’re in a pinch, just buy your favourite store-bought hummus, place it in a bowl and drizzle with good olive oil, chili flakes or paprika and fresh parsley. 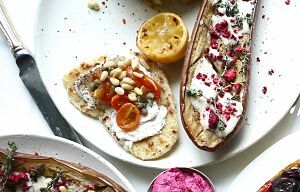 Or you can try this recipe (I usually add a few big glugs of good extra virgin olive oil). This one was a bit of an experiment…but it’s tough to go wrong when roasted chickpeas are involved. How to make: Preheat oven to 400F. Rinse off your chickpeas and lay them between two kitchen towels (or paper towel) to dry. Add chickpeas to a baking sheet and toss with olive oil, salt, pepper and cumin. Roast until they are golden and crispy (about 25 minutes). Check on them often to make sure they’re not burning and to give them a shake in the pan so all sides crisp up. 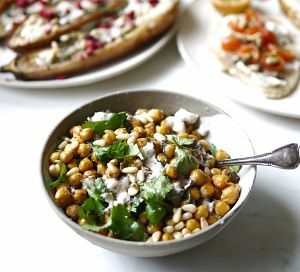 Once golden, remove from oven, add to a bowl and toss in a big handful chopped mint, juice from one lemon, big drizzle evoo, a handful of crumbled vegan goat cheese, a big handful of chopped parsley and a fist-full of pine nuts. Enjoy! These were one of my favourite parts of the meal — and so simple. 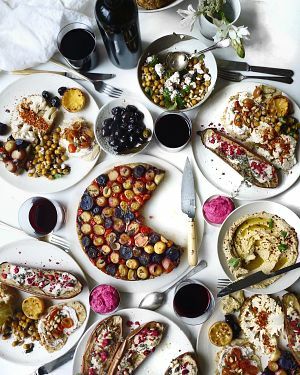 Just spread naan bread with vegan cream cheese and top with roasted cherry tomatoes, capers and pine nuts. Here’s where I got my gluten-free naan dough (which is hitting the market soon). Whole Foods has an amazing selection of olives in their olive bar. I love their Castelvetranos, too (oddly, they taste like salty butter). I love setting out a few oyster cups of ‘flavour enhancers’ (could be as simple as olive oil and balsamic) that my guests can spoon onto their plates and enjoy with certain bites. 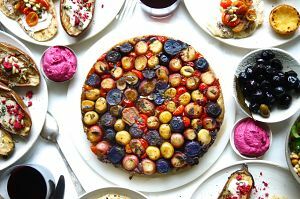 Spread ‘em Kitchen (based in Vancouver) makes my favourite dips in town and they happen to be bright and beautiful. The Beet Balsamic (pictured) is tied for my favourite (along with their Jalapeno Cashew). 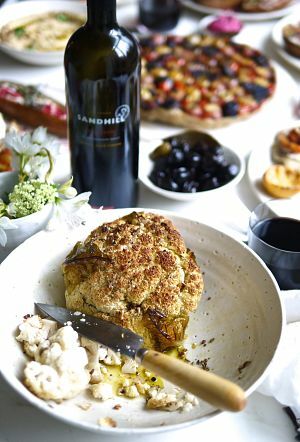 Thanks to Sandhill Wines for sponsoring this dinner party and post! All opinions are my own.